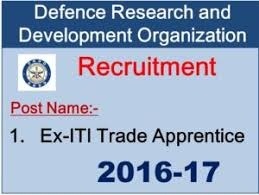 DRDO CVRDE Avadi Ex-ITI Trade Apprentice Recruitment 2017: The list of the central government job recruitments in the year 2017 is increasing day by day with every release of the central government recruitment .The fresh central government recruitment is the DRDO CVRDE Avadi Ex-ITI Trade Apprentice Recruitment 2017 .The vacancies under this recruitment is 146. This recruitment is for the DRDO related organisation that is CVRDE which is located at Avadi Chennai .The advertisement of this notification is emerged on 25th Oct 2017 ,since that day onwards the application form process has been started. They have to be Ex-ITI candidates should have passed out from the Institute duly recognized by NCVT duly covered through Gazette Notification of Ministry of Skill Development and Entrepreneurship, with minimum two years duration except for the Computer Operator & Programming Assistant (COPA) and WELDER (G & E) Trade COPA & WELDER should possess one year ITI certificate recognized by NCVT. The applying candidate age limit is 18 years to maximum 24 years as per the norms of the recruitment board. COPA & Welder: Rs.8609 per month. Other Trades: Rs.9008 per month. Submit the Filled application Form to CVRDE, DRDO – Combat Vehicles Research & Development Establishment, Avadi, Chennai website (direct link is given below) along with postal orders of Rs.30/- from October 25, 2017 to November 15, 2017. The application form will be accepted only in the offline format only by the recruitment board .The applicants must download the application form copy and take the print out of the application form .Later to it ,write the details in the blanks of the application form clearly and correctly.Then post it in an envelope to the address.Marks should be entered in the application form has to be very correct .Because the merit of these marks only will be taken into count for calling the interview round. The salary package and allotment order of these will get confirmed only after your final selection.Just like these type of special recruitments more recruitments also there at the present time.To get a idea about all these recruitments ,just keep in touch with this site Jobschat.in .Here you will get the information of all the jobs updates minute to minute.